What Will Happen Next in the Worldwide Currency War? Last week, the European Central Bank announced its version of quantitative easing. Even Russia decided to lower interest rates last Friday. This was yet another attempt by a central bank to devaluate its currency more than other central banks. The Russian central bank was the fourteenth central bank to undertake an (even) more expansive monetary policy. Currency devaluation is the policy choice of all central banks worldwide. It is a race to the bottom. It is logically impossible for all currencies to depreciate relative to one another at the same time. However, it is possible that central banks devaluate relative to something else. Historically speaking, this “something else” have always been “hard” assets (commodities). In this respect, the recent drop in commodities should be viewed as an opportunity, and not as an indication marking the end of rising commodities prices. We can see that the worldwide policy of currency devaluations must lead to one monetary intervention after another. From an economic point of view, a devaluation is fully neutralized if other central banks devaluate more. This creates an incentive to devaluate as quickly as possible. In sum, this is a race to the bottom with currencies that decline in value at ever increasing speed. Which Currency Will Follow the Swiss Franc? The sudden announcement by the Swiss National Bank that it was abandoning its peg to the euro immediately, led to worldwide turmoil. Last week, I already emphasized that the Danish krone would come under pressure due to the Swiss announcement. After all, Denmark has pegged the krone to the euro. Among others, I considered buying a call option on the Danish krone. This week it became clear that not only the Danish krone is facing difficulties. The Chinese yuan — considered by many as an almost unassailable currency with an indestructible peg to the dollar — is also under pressure. It is only a matter of time until the remaining central banks are forced to abandon their exchange rate ceilings. Switzerland and Russia were the first to surrender. As such, the abandonment of the peg of the franc to the euro may have far-reaching consequences. The risk of financial contagion is high. Speculators are now starting to aim at their next targets who try to maintain an exchange rate ceiling by buying euros (or dollars). The abandonment of the Swiss currency peg has major consequences for the demand for euros and dollars. For many years, the Swiss National Bank has taken euros of the market. These euros did consequently not contribute to higher consumer prices, but also to the euphoria on stock exchanges worldwide. The Swiss National Bank is subsequently partially responsible for low inflation in the Eurozone, despite the continual increase in the quantity of money. M1 (cash and bank deposits) is continually increasing in the Eurozone, but this is not reflected in the prices of our basket of consumer’s goods. Imagine what would happen if central banks, such as China’s, Denmark’s, Switzerland’s and Hong Kong’s — pressured by financial markets — decide to allow their currencies to float. A major part of the demand for dollars and euros would disappear. As a consequence, the current expansionary monetary policy would much sooner lead to a higher consumer price index (inflation in popular language). The velocity of the dollar has reached a 30-year low. The term velocity is actually quite misleading. Money never circulates. It is always part of somebody’s financial balance sheet. 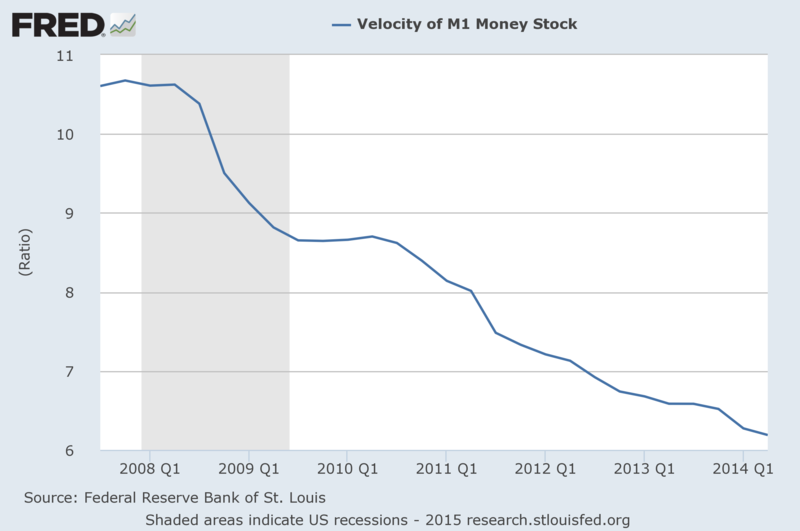 If the velocity of circulation declines, this only means that the demand for money — demand deposits — increases. People hold larger bank deposits and spend less on consumption and investments. What is the cause of the record low in the velocity of circulation? The answer is quite simple. The pegs with the dollar (and euro) that some foreign central banks maintain, have a major impact on the velocity of circulation. Moreover, corporations have increased their cash balances as well, and U.S. commercial banks collectively deposit money at the Federal Reserve System at a riskless interest rate of 0.2%. A new chapter is about to begin in the currency war that has already been going on for years. Central banks could very well collapse one after another in their attempts to maintain their exchange rate ceilings. Central banks are committed to a policy of continually devaluating their currency. Like other hard assets, gold will profit from this.